Boy did I need it. By happy accident, or some strange bit of cosmic fate, the release of The Force Awakens fell on the same day as my College graduation, December 18th, with me and my brother lining up early for a Thursday 7pm preview the night before. I had not thought much of the convergence before then – movies come out every December, and around every Graduation, after all – but now, those two events will forever be linked in my heart and memory in such a way that each will always add extra meaning to the other. Graduation, after all, marked the end of a long road for me. I received two degrees – a Bachelor of Arts and Master of Arts, completed concurrently – after a four-and-a-half-year program, during which I had been more immersed in movies than at any other point in my life. And since I began writing about movies regularly in 2004, 2015 marks the twelfth year in which my writing has been largely devoted to cinema, a long amount of time for a person to spend doing anything. And I will admit…there came a point, early this year, where I just found myself completely and totally burned out, felt that fiery passion for cinema that had always burned so bright inside myself start to dissipate a little. I stopped seeing as many movies in the theatre. I largely stopped making the effort to attend press screenings. I bought new Blu-rays and DVDs here and there, but mostly let them pile up on my desk, even if they were releases I felt particularly excited about, always telling myself I would get to them later, but gradually realizing how much of a platitude that had become. And amidst it all, I wrote fewer film reviews than I have in any of these past twelve years. I told myself I was busy, that my last year of school demanded more of my time than other years had, and while there was some truth to that, I know I could have made the time to see and write about more movies in 2015. There are always ways to make time for something one is passionate about – but when the passion isn’t there, or feels like it has somehow fallen away, that time inevitably goes to other things. And it’s not like there weren’t plenty of great movies this year, of course. Any year that can boast both Mad Max: Fury Road and Inside Out, two full-stop masterpieces released within mere weeks of each other by major movie studios, is a special year indeed, and that is of course only the tip of the iceberg. The problem this year wasn’t with the movies. It was with me. I had been doing this too long. I’d spent too much time focused on movies and writing about movies and though I had never really lost my love for movies, I had lost some of the spark – the magic became so commonplace, such an overwhelming part of my daily personal, academic, and professional routine, that none of it felt very special anymore. I have been thinking a lot, since Thursday night, about how best to summarize my reaction to The Force Awakens, and to everything that opening night experience meant to me, and ‘magic’ is indeed the word I keep coming back to. Because what I felt in that theatre, watching what J.J. Abrams and company created unfold, goes so far beyond ‘fun,’ or ‘enthusiasm,’ or ‘joy,’ or ‘surprise,’ or ‘excitement.’ It encompasses all of those things, but surpasses each emotion in turn. What I felt was nothing less than my love of cinema being forcefully reignited before my very eyes, feeling that spark that had started to grow cold roar back into fiery life, my own fundamental passion for cinema restored by the sheer love, enthusiasm, and boundless creative energy taking place up on that screen. On the car ride home, my brother asked me how I would describe the impact Star Wars, as a franchise, has had on me as a film lover. It’s a tough question for me to answer, because while I absolutely adored the original trilogy from the time I saw it, and had a lot of fun with the prequels as a child, Star Wars was not the defining cultural experience of my childhood. That would be Harry Potter or especially The Lord of the Rings, the latter of which especially did more to get me ‘into’ cinema as an art form. Star Wars – particularly A New Hope – did a great deal to teach me about world-building, about the value of fantasy and the transportive qualities of the medium, and the razor-sharp way George Lucas breathed life into an archetypal plot structure and set of characters continues to be instructive whenever I return to those films. Star Wars is absolutely a part of me, and has always been, but it’s never been the biggest part, in the way it is for some film lovers. In that way, The Force Awakens may very well be the most electrifying of these movies to me, the one that has already, in some sense, made the biggest impact, because of how beautifully and (seemingly) effortlessly it resurrects the spirit of those original films while doing so many new and exciting things along the way. It feels as pure, distilled, and powerful a version of Star Wars as A New Hope, not as an introduction to this world but as a reintroduction, as a thrilling homecoming that honors the past even as it embraces all sorts of meaningful change. It captures the heart of what makes Star Wars special even as it interrogates that heart at every turn, questioning and expanding upon our understanding of the Force and other fundamental Star Wars ideas in ways that make this world feel richer and more profound. It has a tremendous amount of fun, staging a big, breathless pulp adventure on the sort of scale Lucas himself could only dream of in 1977, but it does so with a respect for and interest in character, theme, and world-building that feels decidedly old-fashioned, explicitly rejecting many of the tired ‘Chosen One’ conventions and overly expository plotting that have unfortunately became standard in the 38 years since Star Wars first debuted. 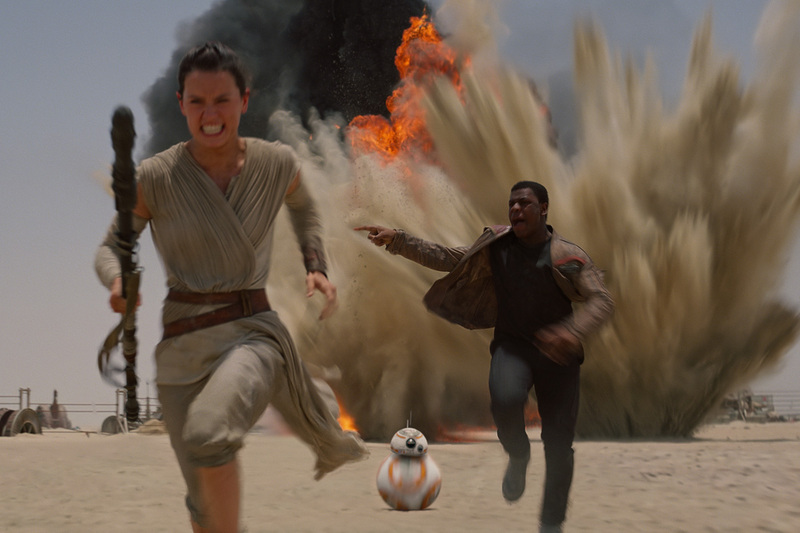 The Force Awakens is birth and re-birth, fresh and nostalgic, a revisitation and a reimagination, all at the same time, and while it belongs to a trend of great movies doing similar things this year – namely Mad Max: Fury Road and Creed – it is working with a far more intense and far-reaching cultural legacy, and its emotional impact is proportionally vast. I just love the passion of this movie. I adore and immensely respect that every single person, at every single level of the film’s production, seems like they are having the creative experience of their lives, and that attitude absolutely reflects on the viewer. The script is just joyous, this celebratory exercise in getting to play within Hollywood’s most iconic toybox, throwing out new characters and interesting ideas left and right, all while staying in conversation with the original films. That sense of narrative opportunity is immense, and yet Abrams and Lawrence Kasdan never overplay their hand, never lean to heavily on returning players or concepts, and never push these characters past a point where they recognizably belong in this universe. This film is all about broadening our conception of what Star Wars is, of who a man like Han Solo or a woman like Leia Organa might be thirty years after we last saw them, or what a hero or villain might look like in the wake of the tectonic shifts of Lucas’ original saga. Yes, the film is explicitly modeled on the structure of A New Hope, but it does so more to emphasize how things have changed rather than to lean on a tired narrative crutch, and it is so massively invigorating to see these storytellers given the keys to the car and hit the gas with such enthusiasm and expertise. Abrams’ direction is so inspired, the way he stages action scenes – particularly the outstanding escape from Jakku, but also Finn and Poe’s first adventure, or the climactic lightsaber duel on a dying planet – feeling like a new director given his first shot behind the camera and attacking every bit of it with a ferocious imagination, albeit with a level of technical skill and expertise that only comes from years of experience. Dan Mindel's cinematography, while honoring the original trilogy, does more than just replicate the look of the first three films, and you can feel him and Abrams positively reveling in the tactile details of this world, in the opportunity to create new locations and atmospheres. Even places like Jakku or Starkiller base, theoretically modeled on locations from the original trilogy, feel new and exciting, gifted with identities that are familiar but not stale, and exploring them is such an immense treat. I have always said that my favorite thing Abrams ever did was the Lost pilot, way back in 2004, and The Force Awakens is, to me, the first time he has really blown past that accomplishment, crafting something that is so vibrant, creative, and energetic it seems to take on a life all its own. It would be easy for The Force Awakens to feel like an exercise in stylistic mimicry, or for Abrams to lean heavily on his tried-and-true bag of visual tricks (lens flares!) to try leaving a mark, but in the end, he took neither approach, and his direction here positively soars. John Williams, meanwhile, seems like he is having the time of his life returning to this world he has done so much to define, and which in turn has done so much to define his career. He uses the original themes and motifs expertly, employing them with enormous emotional precision at key points in the movie (there is one use of Luke’s theme, at a key point in the climax, that just sent chills down my spine, and made for my favorite overall moment in the film), but like the film itself, it is the new material that shines just as strongly. Rey’s theme in particular stands tall alongside the best of Williams’ iconic compositions, and the way he interpolates brief elements from prior themes into the new material – is it just me, or does Kylo Ren’s theme sound like a twisted, transformed version of Anakin’s downfall theme from Revenge of the Sith? – is so very exciting. Listening to the soundtrack, which I have down several times in the past few days, I think this is probably my favorite top-to-bottom Star Wars score since the original, and as he always has, Williams serves as the ultimate shepherd in making this new era of Star Wars feel of a piece with the saga to date. And what an incredible cast Abrams has put together here. It isn’t just the acting, of course – the most impressive thing to me about The Force Awakens is how it introduces so many new characters, and that each of them, from conception to writing to performance, is a complete and total home run. 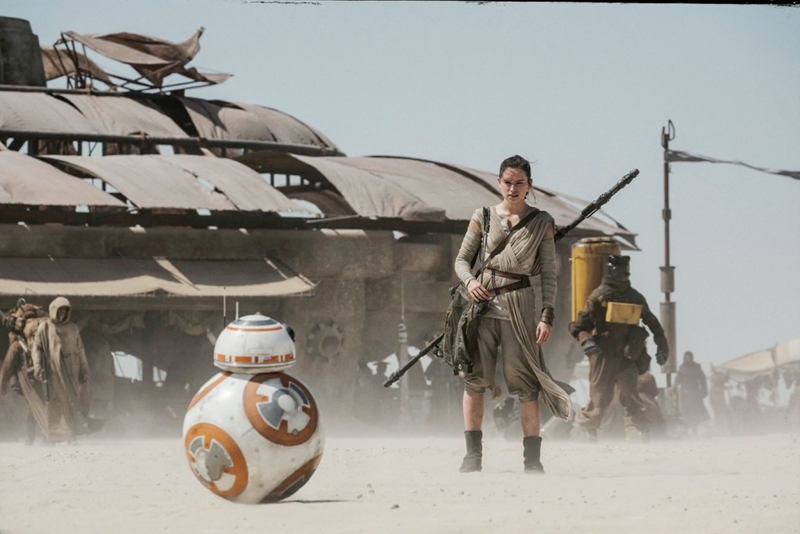 Rey is my favorite of the new characters, a protagonist who echoes elements from other heroes throughout the saga, but is a fully-realized and unique creation in her own right, and if she were the only significant discovery of the film, that might be enough. But then we have Finn, a protagonist whose arc is completely unlike anything Star Wars has ever given us, and Kylo Ren, the most fascinating villain mainstream Hollywood has had in years, and a wonderful dissection of the Darth Vader mythos to boot. Poe Dameron absolutely lives up to the awesomeness of his incredible name, and BB-8 reads so strongly as a character from the moment he’s introduced. Between the new cast of characters and the expertly utilized returning players, The Force Awakens has far and away the richest, deepest, and most interesting ensemble Star Wars has ever had, and those actors do indeed tear into the material with gusto. John Boyega and Oscar Isaac are the two clearly having the most ‘fun,’ each clearly fulfilling lifelong dreams up there on the screen, but they also manage to channel that infectious energy into the characters, relishing the opportunity not just to be in Star Wars, but to create interesting new characters on this grand operatic scale. Daisy Ridley is on fire, committing herself fully to this world to a point where it's hard to even know what to say about the performance; like Mark Hamill in A New Hope, she brings such an immense sense of naturalism to the role that it does not even look like acting, but as if she was born and raised and lives and breathes within this other world. She is just tremendous, and manages to have a strong sense of chemistry with every other performer she encounters. Adam Driver – the actor I am most familiar with among the new cast, having watched him for four years on HBO’s Girls – brings all of his considerable talent to bear on this fascinating new villain, and I love how he essentially has to play two versions of the same character – the masked monstrosity seething with angry, and the petulant child hiding behind the cloak – and effortlessly makes the entire performance feel unified. 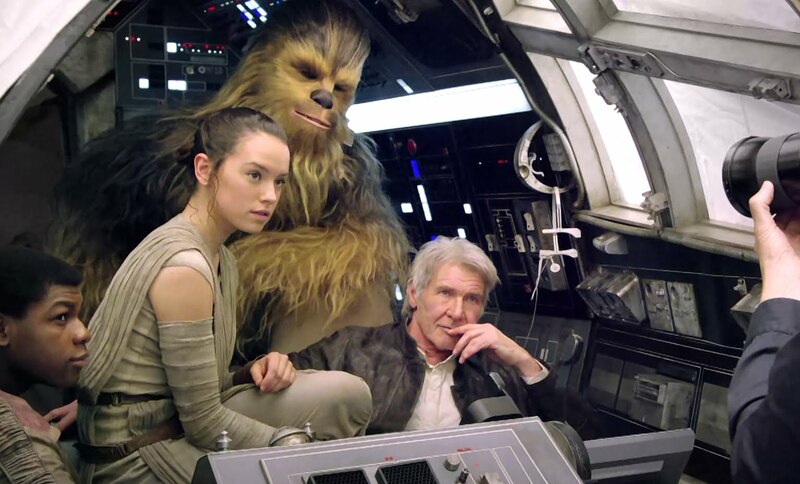 Even Harrison Ford seems energized by this film, appearing here more engaged and enthusiastic than he has been in years – which is perhaps the ultimate sign of how much goodwill and passion this project engendered among all who worked on it. Ford does not miss a beat adapting Han Solo to be older, wiser, and sadder, and along the way, he not only gets the biggest laughs of the film – “That’s not how the Force works!” – but also some of the most poignant emotional moments. Above all else, I love the sheer density of detail on display in this film. It is something that defines Star Wars across all its many eras and incarnations – that sense that there are a dozen different stories to be told in any given frame – and a quality The Force Awakens captures so beautifully. Its world is rich in so many ways, and yet Abrams and company pull it off with very little in the way of formal exposition. All we glean about the backstories of Kylo Ren, Han Solo, the Resistance, the First Order, Rey, and others, we do mostly through action, with a lot of gaps left to be filled in either by the viewer or, perhaps, in future films. The Force Awakens tells a complete story, with arcs that begin, develop, and reach a point of resolution for each of the principle characters, but along the way, there seem to be a thousand visual, narrative, or character details worth pondering, and so many of them are so immensely exciting. Like A New Hope, The Force Awakens is all about discovery, and like its predecessor, The Force Awakens does such a fantastic job of creating a fully-realized world, filling it with characters and incident, and inspiring the imagination of the viewer. That’s what allows the film to live with the viewer, prompts the viewer to continue thinking about and discussing it, and what will ultimately make people see the film again and again and again, not out of any sense of obligation but from genuine excitement. That is what Star Wars is, and in some ways, that it what, at its best, film is. And I am firmly convinced that The Force Awakens is both Star Wars and cinema itself at its shining best – at its most intensely magical. All of this is why I love The Force Awakens – because it feels, first and foremost, like a fundamental celebration of this strange magic we call filmmaking, this odd collaborative chemistry that is created by a group of artists coming together in favor a singular goal. And when all those artists share a similar level of passion, and when the love for what they are making is so eminently palpable, and when the love and enthusiasm from the audience is mirrored entirely up there on the screen...well, that is why we all do this in the first place, isn’t it? To seek out experiences like this one, where all comes together in a display of pure creative energy. At its finest, cinema can be a sort of communal artistic exercise, a power that no other medium can wield in quite the same way. Does that make The Force Awakens one of the very best movies I’ve ever seen? No, not in the sense that I would rank it as or among masterworks. But is it one of the single most magical experiences I have ever had in a movie theatre? Absolutely, and what it accomplishes feels so unique and unexpected and invigorating that I have to love it, as much or more than any other film this year.